Obama and His "Campaign Hacks"
One of the best reads on Obama comes from John F. Harris on "7 Stories Obama Doesn't Want Told." Harris' article will strike home to most of Obama's critics who will see the 7 news stories as neatly summarized points Obama's opponents have been trying to voice the last few years towards the mesmerized media and followers. Harris also makes clear these 7 perceptions of Obama are issues that Obama must worry about taking hold in the public's mind about his character and job performance. One of these issues is that Obama feels as if he is playing with "Monopoly" money. That point is beginning to take a very strong hold in America's mind, and as Harris points out, Obama realizes the danger as well. This is one reason Obama will focus on cost control in 2010. The bribing of politicians is clear for all to see as votes are bought and others are strong-armed. Americans do have a distaste for political corruption that is blatantly acted out on the large public stage health-care reform has provided. It isn't that Americans are naive,but when these so called "Chicago politics" are openly approved of and acted upon by those in power, the voters will soon show their disapproval and 2010 is upon us. If we do not change...Obama warned: "... if we do not change our politics � if we do not fundamentally change the way Washington works � then the problems we’ve been talking about for the last generation will be the same ones that haunt us for generations to come..." ~Obama, 2007. Now reality sets in and Sen.Chris Dodd of Connecticut is in trouble with voters back home. Dodd has been hounded by nasty scandals all year long beginning with a report in June that he was on a list of V.I.P.’s who were given preferred rates on home loans by Countrywide Financial, a lender heavily involved in the sub-prime mortgage meltdown. Remember, Dodd had oversight of that industry as a member, and now is Chairman of the Senate Banking Committee. Back in April, the New York Times wrote an article saying of how much help Obama could be to the beleagured Dodd back home in Connecticut. Today things are a little different. Obama will now start to look at the upcoming elections as a portent of things to come down his own political path. His poll ratings are down considerably. So Obama has spent the last few days jetting around the N.E. 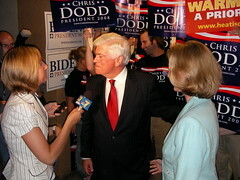 campaigning the same old talk for Senator Chris Dodd, Gov. Deval Patrick, and poor gubernatorial hopeful Creigh Deeds of Virginia. So..."Hello Connecticut!".... "Hello, Boston! "...and soon "Hello, Virginia!" ..."and if we do not change...well, we can not change...not just yet." Remember Burt Bacharach and "Promises, Promises" ? Reuters ran a little flak for Barack Obama trying to help dull the outrageous expectations placed on The One by his irrationally exuberant adherents in theirs headlined "Congress faces historic challenges" -- As if no other Congress has faced "historic challenges" before? Reuters assures us, though, that times are so bad that we should not expect Obama to live up to any of his outlandish promises. This way, of course, if Obama reneges on them, the Old Media can remind everyone that it’s really our fault for expecting too much, not Obama's for reneging.